RECIPE TITLE "Artichoke Hearts in Olive Oil and Lemon Marinade (Shawki b'Zeit)"
recipe excerpted from: Aromas of Aleppo: The Legendary Cuisine of Syrian Jews Copyright © by Poopa Dweck. All rights reserved. Freshly marinated artichokes hearts are much more flavorful than the store-bought varieties. The process is rewarding and not too difficult. When shopping for artichokes, look for ones with bracts that are tightly closed or only slightly open. Artichokes should be firm and fresh looking, with no brown or soft spots. They should also feel heavy. If the underside of an artichoke stem has small holes, do not buy it, as it may have worm damage. Squeeze it—if it sounds squeaky, it is okay. To store, place dry artichokes in a plastic bag and refrigerate for no more than 5 days. 1. Put the acidulated water near the work area and trim the artichokes. Remove the tough bracts (outer leaves), cut the artichokes in half lengthwise, and remove the hairy inner chokes, trimming the leaves close to the hearts. 2. Cut the artichoke hearts into quarters, or into sixths if they are large. After each one is cut, place it in the acidulated water, so it will not discolor. 3. When all the artichoke hearts have been prepared, remove them from the bowl and arrange them in a large glass jar. 4. Combine the olive oil, fresh lemon juice, and salt in a small glassbowl. Mix well. 5. Pour the lemon-oil marinade over the artichoke hearts, adding more oil if necessary to cover them completely. Seal the jar tightly and leave at room temperature for 2 to 3 days, rotating the jar a few times each day. Store in the refrigerator for up to 1 week. Serve the artichokes on a tray with a small amount of the brine. Sometimes we need a little inspiration when it comes to adding more vegetables to our plate. 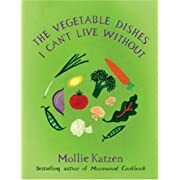 Thankfully for us, Mollie Katzen knows a thing or two about vegetables! On the 30th anniversary of her groundbreaking Moosewood Cookbook, Mollie presents just under 100 delicious vegetable side dishes in this delightful and beautiful cookbook. Whether you need an appetizer, a quick and easy snack for the kids, or something to accompany a main dish, this cookbook offers creative recipes and countless ways to infuse more vegetables into our diets. Whether you want to bake dairy- and egg-free for health, ethical, or environmental reasons, The Joy of Vegan Baking lets you have your cake and eat it, too! Featuring 150 familiar favorites -- from cakes, cookies, and crepes to pies, puddings, and pastries -- this book will show you just how easy, convenient, and delectable baking without eggs and dairy can be. A seasoned cooking instructor and self-described "joyful vegan," author Colleen Patrick-Goudreau puts to rest the myth that vegan baking is an inferior alternative to non-vegan baking, putting it in its rightful place as a legitimate contender in the baking arena. More than just a collection of recipes, this informative cookbook is a valuable resource for any baker -- novice or seasoned. 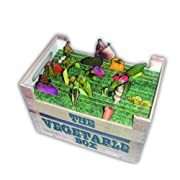 300 ways to make cooking and eating vegetables interesting in this fun format--a truly unique product. Each book corresponds to two vegetables and an additional feature of the box are the dividers which separate the books - each has a list of recipes contained in the corresponding book for quick reference. About the Author: Keda Black is a French home cook and food writer. She was born in Zambia and is of a thoroughly mixed Scottish, Bourguignon, Spanish and Italian descent. Having become a trained chief librarian, she strangely found herself more eager to go out looking for new taste sensations or sweat in front of a hot stove, rather than to sit at a computer scanning databases. So she now divides most of her time between kids and kitchen. Unsurprisingly, her cooking tends to go beyond the boundaries of traditional French cuisine but is never complicated or labored. She has already written about cheesecakes, pot-au-feu, vegetables, charlottes. Her latest books include a step by step basics cookery course as well as a mega Cake Box full of sweet delights. 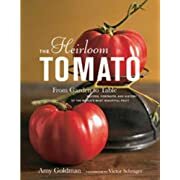 From the world-class garden of acclaimed food writer Amy Goldman, a gorgeously illustrated guide to the world’s most beautiful and delicious tomatoes. Every year, renowned grower Amy Goldman produces an amazing 500 varieties of tomatoes on her farm in New York’s Hudson Valley. Here, in 250 gorgeous photos and Goldman’s erudite, charming prose, is the cream of the crop, from glorious heirloom beefsteaks – that delicious tomato you had as a kid but can’t seem to find anymore – to exotica like the currant tomato, a pea-sized fruit with a surprisingly big flavor. Along with the photos are profiles of the tomatoes, filled with fascinating facts on their history and provenance; a section of more than 50 delicious recipes; and a master gardener’s guide to growing your own. More than just a loving look at one of the world's great edibles, this is a philosophy of eating and conservation between covers — an irresistible book for anyone who loves to garden or loves to eat.